the Rockland Rink! This program is geared towards children ages 4-8 who want to learn to play hockey. This is not a learn to skate program. Full hockey gear is required. Players will be divided up according to skill level and age. Our coaches will work on the basics of hockey and skating while encouraging your child to be creative and have fun with hockey! This is a low stress, fun environment for your child to learn to be a better hockey player and make some new friends. 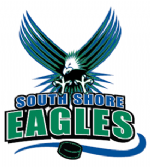 South Shore Eagles jersey included!! Go to www.southshoreeagles.com and click on the “REGISTER NOW” button to reserve your spot! Please contact LTPH/Instructional Director John McGrath at jmcgrath21@yahoo.com with questions regarding the Eagles Learn to Play Hockey!